This recently renovated, artist-designed house has been built in a totally unique location with the most spectacular lake views. Perch on top of a large rock formation like a monastery looking down at the village and looking strait at one of the most beautiful lakes in the world. The house is nest in nature with TOTAL privacy, (1.5 acres of land) to enjoy birds watching, wild life and lush tropical gardens. This powerful place use to belong to a local Shaman who was using it for Mayan ceremony. Today it is a lovely, peaceful and healing retreat, where Indoor and outdoor areas have been designed to capture the most exquisite lake views and to make you feel like you are floating in the crisp, clear air of the lake. The master Bedroom, living room, bathroom, covered terrace and hot tub have the same stunning lake view. Guest room, Kitchen and bathroom are facing the garden. I love to cook, and the kitchen is practical and esthetic. I have been designing and building this house for the past nine years, turning a dream into reality, focusing on unique features and artistic design. The gardens are green and lush, providing tranquil areas for relaxation and privacy with lots of fruits trees, herbs and the veggie garden. The outside terrace is 600 sqFeet, perfect for outside dining, dancing, party, gathering, yoga and meditation. The Shaman's rock is comfortable and classy retreat form the stressful world, an ideal honeymoon suite or a quiet retreat for artists, writers and yoga practitioners. The house has spring water from the mountain. The hot tub with the cozy wood heat is built on the side of the cliff with view of the lake and the cliffs. It is quiet a spectacular spot from where you can also enjoy watching the sunset, the stars and the moon. And the garden light give it a special ferry like feel. Note : To get to the house it is a little bit of a walk. 12-15 minutes from the public dock. And about 120 steps. We have now a Tuktuk in town, it can take you half way to the top. You can have all your shopping and meals delivered to the house. The house doesn't have a generator but usually the power shortage are not very long not so frequent. I am a European Designer/Photographer. When on the rock, It feels like you're flying! It's one of the most unique place on earth. It has a spectacular view of the lake. It's is very private and peaceful. I love to be immerse in nature and feel it all around me. The village of Jaibalito has no road access it's safe and tranquil. The weather is perfect almost 350 days a the year. And I love the rainy season, it's all green. It only rains in the afternoon or at night and we have usually have sun in the mornings until about 2pm. The bathroom, is semi open to the garden. The shower is totally protected from the wind and rain. The house is as it appears in the pictures. Quite lovely and at a fair price for Westerners. We were disappointed in our decision to stay in Jaibalito, once we had been outside to see other towns around the lake. Jaibalito was very odd. Dogs bark and roosters crow 24 hours of the day. People are very poor and there were very few places to go for food and drink, let alone any entertainment. If we went back to Atitlan, we would stay in one of the larger towns. Perhaps Jaibalito would others better however. When we stayed in the house, we were happy. As long as the internet and power was working. (Which it didn't 2 days, due to high winds). The only thing that we found unpleasant about the property was that upon our arrival, we had to clear the house of 2 scorpions, and 3 large black spiders. (My wife objected to the spiders presence). Be prepared for the Guatemalans to try to overcharge you for everything, and be sure to check your bills, as there is almost always an error in their favor. If you are looking for an adventure, this may be your place. We rented Nathalie's house on the mountain for six weeks-for our family of six. It was an unbelievable experience. We wanted to immerse our kids in the culture of the country and of the village. We rented Nathalie's other village house to do arts and crafts and games with the village kids, and it was such a blessing! We got to know all the kids, played with them, became friends, jumped off the docks and swam, did activities with them, held a small store for them to earn coins and buy a piece of clothing or toy, we just immensely enjoyed the whole experience. Nathalie's home on the hill is magnificent. It is set up completely to enjoy the outdoors, which we did. The hike is a small hike, but only a small price to pay for the unbelievable views and the privacy. We visited the markets a couple times a week in Pana, visited the orphanage in Solola(Eagle's Nest), helped build garden beds for Mayans who completed their classes so they can grow fresh food for themselves through Mayan Eco Homestead, and tried to teach and love the village kids. We loved the boats to and from Pana, which we will miss the most. It's the best commute you will ever have in your life. Nathalie is a great host, and Luciano, the 14 year old boy who takes care of the house and anything you need became our friend and buddy. He had kids at the dock when we arrived in a rainstorm, and they grabbed our luggage, put it on their heads, and ran it to the house. Same for when we were leaving. Very helpful, fixed things if they needed it, very responsible. All I can say to sum up is, it was a life changing experience. The house was magnificent, the village was a great experience, Nathalie is awesome, and our family will miss it there completely. Thanks Nathalie!!! This property is absolutely gorgeous, a true wonder. It was built taking into account every detail, from functionality to good taste and it`s built over a huge rock. When you get to the house, the most impressive thing you notice is the beauty and majesty of Atitlan Lake and it´s volcanoes (from left to right: Tolimán 3158 m., Atitlán 3535 m. and San Pedro 3020 m.). The house is surrounded by the mountains, having the best toilette view ever. The hut tub heated with wood is perfect for relaxing with a good wine and enjoy the sights and sounds of nature. Eating in the terrace is a pleasure, no matter what time of the day. Cooking in the well equiped kitchen is inspiring, also a bunch of great cook books, and is very easy to pick up vegetables, spices and fruits from the garden. It is possible to have delivery from La Casa del Mundo and a couple of other restaurants as well. The bathroom with tub and shower has great view and very hot water. Ideal place for yoga and meditation. Not a place suitable for young kids, unless supervised at all times. Access to the house is quite difficult if you are not physically fit, especially hauling luggage. Although you can hire a bunch of people to help carrying the luggage for Q5 each. Private shuttles to and from all other towns in the lake are available booked with time. To sit on the balcony`s hammock reading a good book is an awesome experience. In conclution it is worth the climbing, and it is an amazing place to have a great time. Our family is looking forward to visit the house again. Thank you for this beautifully written review. It was lovely to meet you and your family. Nathalie's home in Jaibalito is unlike anywhere I've ever been before. The views were out of this world and the house itself was state-of-the-art. We quickly grew to love the culture and the people of Jaibalito and all around Lake Atitlan, and felt so at home after just one week. I had a wonderful time practicing my Spanish with Luciano, who helped around the house. I must admit, even after reading the reviews, the hike combined with the 120 steps up to the house was a bit more intense than we imagined - probably 20 minutes or so to get to the top. It's worth the effort - there's no other view like it around the lake. We really enjoyed Hans' Posada, where we ate breakfast, lunch and dinner often. The tienda in Jaibalito also carried much of what we needed for the week. We visited the mercado in Solola as well - a true cultural experience and an unbelievable selection of fresh food. We also recommend the horseback riding at Finca Xetuc in Santiago Atitlan and the women's weaving co-op Casa Flor Ixcaco in San Juan. The Mayan Herbal Medicine Gardens in Panajachel are wonderful for an informative excursion as well. We stayed at Casa Nathalie for 10 nights in February and really enjoyed it. For the first week it was myself (mom) and son (nearly 5 yrs old) and we had a blast exploring the lake, hiking the trails, taking boat rides and walking through Jaibalito, Santiago and San Juan la Laguna. The house is perched at the very top of the village and it is quite a trek. We enjoyed taking the walk and would pack snacks and water and everything we needed for the day before heading out as it's not really a walk you want to make over and over during a day. It's really not possible to make the walk after dark as the trail is too challenging without adequate light so plan on meals at the house (either prepared by yourself or ordered as take-out and delivered from one of the local places). The village is unlike the others around Atitlan, it's very traditional and not tourist-focused, which we enjoyed. Everyone is extremely friendly and welcoming. There are three or four places nearby to eat and taking the boat to Santa Cruz for a meal at Isla Verde is easy, or hiking the trail to the next town is also recommended. The house itself is beautiful, the patio offers stunning views and the wood-fired hot tub was priceless! Guests should know that the bathroom is completely open to the elements and some nights it was quite cold or windy and you do have to go outside (it is covered) to use the loo or bath. The kitchen is well-stocked and the wi-fi was excellent, we were able to stream music, etc. My parents and husband joined us, too, and with 4 adults in the house it was a bit tight - especially the dining area as the table is quite small. I wouldn't really recommend the house to two couples, it's a bit too cozy and the bathroom isn't very private. Parents with children would have ample space. The house is on a very steep cliff so it is a bit risky for young children, my child is very cautious so I wasn't too worried. The staff was excellent and Luciano, the young caretaker assistant was incredibly kind and interacted so nicely with my son. 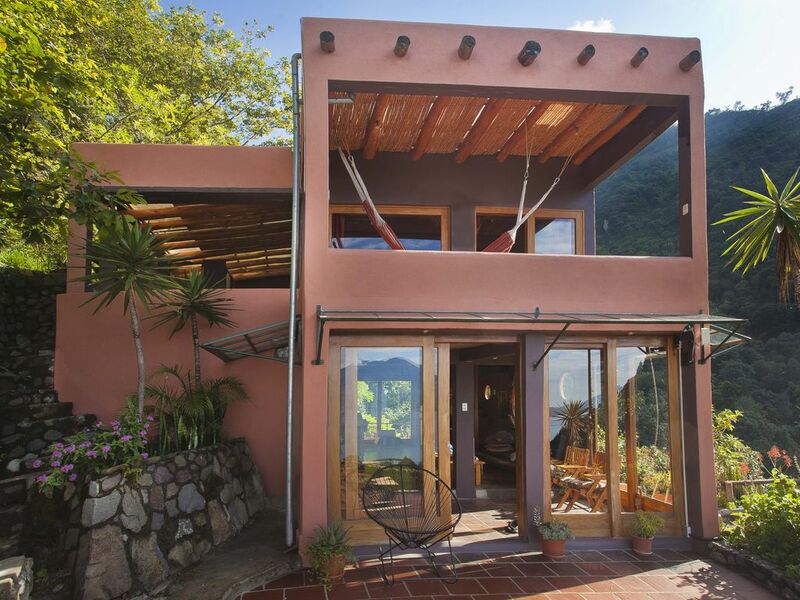 I would definitely recommend the house to anyone who is looking for something different in Lake Atitlan, something more local, but with great style. I should note, that you can hear the music, church, dogs barking and sounds from the village at the house, sometimes louder than others, but I didn't find it bothersome. So many great memories sitting with a glass of wine enjoying the view or soaking in the hot tub. What a great getaway! For future guest , I have rented the house for 3 years now, no one ever had a problem coming back home at night. There is only a very short walk without light (3 minutes). Indeed you need a flashlight, but don't prive yourself from eating out at night. If walking 3 minutes in the dark is a problem, Guatemala may be to adventurous for you. Also If you feel more comfortable you can ask a kid in town to come along with you to show you the path. The village is full kids. When you get near the house, there is light on the path. You can turn it on before leaving so the house path is lite up when you come back. There is a 6 person dinning table outside, feel free to ask the staff to bring it in for you if you like, it takes 2 minutes and it fits perfectly in the space next to the chimney. The table in the kitchen has extender. It is narrow but it fit 4 person. The bathroom is semi open, the shower is inclosed to protect from the wind. Temperature here are between 66 and 78 degree all year. All my guest just love the open bathroom. I never had any complains. There is the extra toilette next to the hot tub if you need more privacy. what is not mention but that is actually relevant, is there is not much noise privacy between the two bedroom, it is a large room separated by a wood divider. So indeed for two couple it may not be the best if you want privacy. But again everybody else loved it. I had many couples with children of all ages staying and visiting, never anybody had a problem, but I understand your concern, especially if you have a turbulent child or in the delicate age between crawling and walking, they need supervision. We just love this place, it is so unique, peaceful and tranquil and the view is amazing, really spectacular. The house is built on top of a huge rock. The decoration and the house design is refined and everywhere you look you can see that there is attention to every details. From all the windows and terrace you can enjoy this majestic view. It is a little bit of a hike to get to the house, but all worth it. Nathalie has been really helpful. We really enjoyed the village and the Mayans and the atmosphere at the Posada. The staff at the house is really sweet, Venturo and Luciano were very helpful. And the hot tub was really the cherry on the cake. The writer Aldous Huxley called it 'the most beautiful lake in the world. The climate is high tropical (about 5,000 feet), meaning warm sunny days most of the year with cool breezy nights that sometimes dip to delightful fleece temperatures. The rainy season may means a downpour or two in the evening, but the days are generally dry. Jaibalito is located in the middle of Lake Atitlans North shore and is a great base for day trips. A half hour water taxi ride East takes you to Panajachel and a half hour boat ride West takes you to San Pedro. San Marcos is 15 minutes by water taxi or a 2 hours hike and Santa Cruz is 5 minutes by boat or a half hour hike. Jaibalito is the smallest of the shore villages and is the only with absolutely no motorized vehicles. There is great hiking to other towns or in Jaibalitos 2 valleys. However, all arrive by water taxi. After you arrive at the Jaibalito dock, it is a 12 minute walk to the house. Jaibalito is a small authentic Mayan Kachiquel village of about a thousand people. Most women still dress in traditional clothing. The small churches with their live bands are quiet folkloric. The Kachiquel people are busy gathering wood, picking the coffee harvest and making tortillas as the kids play hopscotch and soccer. You can buy fruit, veggies, hot meals, homemade brown bread, wine, beer sodas, cigarettes, cheese ... at Posada Jaibalito in the center of town. And you can have it delivered to the house. The town is a small and true Kachiquel village. First But first it's a perfect place to relax, treat yourself with a nice massage, join a yoga class. There is many activities and services here that are heath and well being orientated. Dentist are really cheap here and do good work. Also I would suggest you hire a private boat to do a lake tour. Best is early morning to enjoy a quiet lake. All the village a something different and unique to offer. You can also walk from village to village. The main town is Panajachel, you'll find ATM, banks, travel agency, bus connection and shops. It's a 20 minutes boat ride from Jaibalito. The village of San Antonio Palopo has very nice pottery, and it is worth visiting. Santiago is on the other side of the lake and a bit difficult to access direct unless with private boat. It is the biggest town on the lake. You can visit The nature reserve in Panajachel and the do the Sunday market, find lots of souvenirs and gift to bring home from calle Santander. And If i am in town, i offer private photography workshop. You will find at the house the phone number and information for the activities and services at the lake.